SLUG Senior Writer, Mariah Mellus, chats with the women behind Elementé before they close up shop this June. Plus, new music from SLC indie-rock band Suburban Birds. 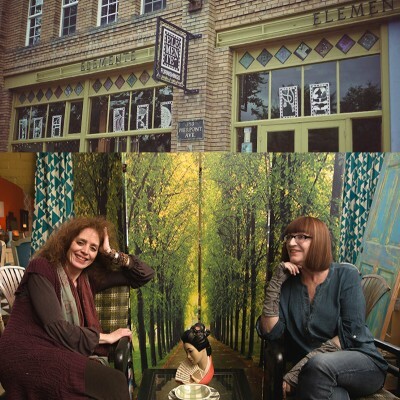 Elemente was founded in 1988 on Pierpont Avenue by Kate Bullen and Teresa Bell. The shop offers a wide array of furniture made between the 1940’s to the 1970’s, most of it not easily reproduced or able to find these days. The shop will be closing its doors in mid-June, and are currently clearing their entire inventory before shutting down for good. In 1988, owner Kate Bullen got the idea for Elementé after another small antique furniture store opened in 1988 on 9th and 9th. Back then, Pierpont was simply a warehouse district and rent was cheap, so Kate and company spearheaded the idea of bringing businesses to the otherwise rural area of town. As of late, the building is home to many art spaces, business fronts and even the SLUG Magazine HQ. Walking by Elementé, the eclectic taste curated by Bullen and Bell is immediately noticed as rare pieces of furniture in bright colors and shapes sit near the window. The store is set up so that each area has a different theme or color palette and, as a whole, the store looks bright and welcoming. Music for this episode was provided by Suburban Birds and Linus Stubbs. Suburban Birds is an experimental pop and psychedelic rock band from Salt Lake and Linus Stubbs is a hip-hop group from Ogden. More information on Suburban Birds and Linus Stubbs can be found on their Bandcamp pages.